"That's L.A. They worship everything & value nothing." 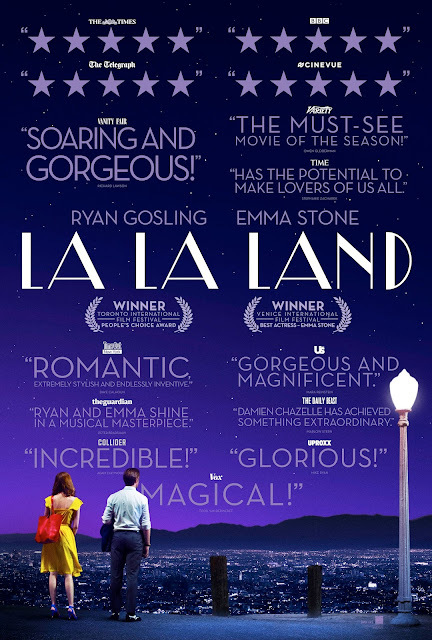 That's an awesome quote from Ryan Gosling in La La Land, the greatest film musical ever made. Gosling plays Sebastian Wilder, a jazz musician. During a traffic jam, he meets Mia Dolan (played by Emma Stone), a struggling actress/barista. After that, they begin to run into each other at various places, including the club that Sebastian works at, Mia's coffee shop & at a party where Sebastian is the keyboardist for a 1980's cover band. This eventually leads to them going on a date, where Sebastian & Mia talk about their hopes & dreams, leading to romance. Sebastian is eventually asked by a high school classmate, Keith (played by John Legend), to be the keyboardist in his jazz band, to which he accepts. Also, Mia is working on a one-woman play, So Long, Boulder City. But Sebastian & Mia's dreams that they have worked so hard for are threatening to tear apart their budding romance. The cast is spectacular, with Gosling & Stone looking like definite locks for Oscar nominations. Damien Chazelle's direction & screenplay is phenomenal. The cinematography by Linus Sandgren is absolutely breathtaking. The film editing by Tom Cross is amazing. The production design by David Wasco is beautiful. The costume design by Mary Zophres is excellent. The sound editing & sound mixing are excellent. And Justin Hurwitz's film score & original songs are some of the best in film history. This is the best film of the year so far.